Sergey Sobyanin took office as Mayor of Moscow. The inauguration took place on September 18, in the recently opened Zaryadye concert hall. 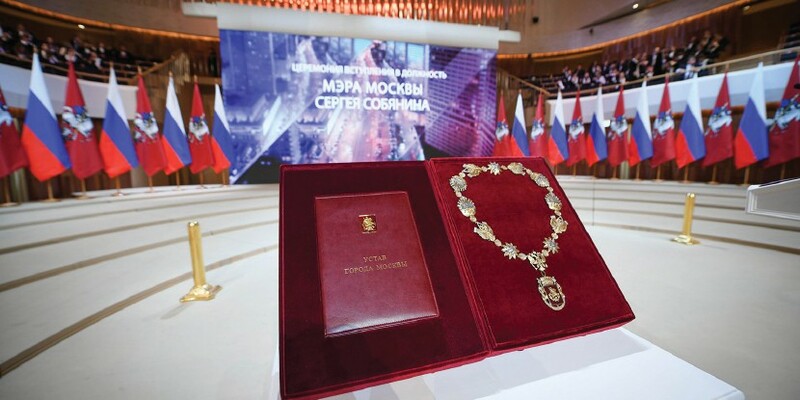 Chairman of the Election Committee of the City of Moscow Valentin Gorbunov presented Sergey Sobyanin with an election certificate and the title of Mayor of Moscow – a medallion on a chain with the image of the city’s patron Saint George the Victorious slaying a serpent with his spear. “You have a lot of work to do for Moscow and Muscovites,” he declared. Sergey Sobyanin thanked the President and the Government of the Russian Federation for the support, and thanked Muscovites for placing their trust in him. “This is a sign of appreciation of the difficult, challenging path that we’ve traversed over the past few years. It’s an appreciation of the programs that we’ve implemented with millions of Muscovites – changes in the spheres of education, healthcare, transport, public spaces, city improvements, safety, and the economy. And of course, it’s an expression of hope and confidence in the fact that positive changes will continue to happen in our city,” he said. Proposals from other candidates and the wishes of those who voted for them will also be taken into account. “I want to assure Moscow residents that I will do everything in my power to live up to the expectations they’ve expressed by putting their trust in me. We’ll work together for the benefit of Moscow and for the benefit of our country,” Sergey Sobyanin said. He also expressed gratitude to his confidants, volunteers, and everybody who played an active role in the election campaign. A total of 2,259,079 city residents voted in the elections. 70.17% of voters – the absolute majority – elected Sergey Sobyanin. The editorial staff of Capital Ideas would like to congratulate Sergey Sobyanin with his election to the office of the Mayor of Moscow. We wish him success in his work for the benefit of city residents.